Born and raised B.C. wildlife Artist Lynn Erikson has explored the rugged nature and native wildlife of the Pemberton Valley and surrounding areas for many years. These experiences have greatly contributed to her vibrant watercolours and bold acrylics. What really has Erikson inspired these days is her ongoing love of bears. In 2009, Lynn spent several days exploring part of Canada’s only Grizzly Bear Sanctuary in the Khutzeymateen Valley north of Prince Rupert. There, Lynn experienced first hand the incredible true nature of the Grizzly Bear. After encountering the 15 or so Grizzly Bears, she came away with a new understanding of these beautiful animals. 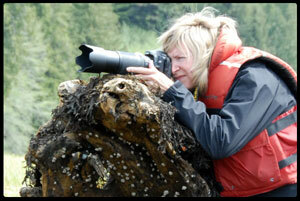 Lynn now continues her study of bears in the BC and Alberta Rockies each summer. In this body of work, she reveals their kind spirit and almost human like qualities. Lynn’s hope is to share her experiences of the emotions and antics of these bears. She invites you to embark on a journey into the life of the Grizzly Bear. Lynn is a member of Artist for Conservation,Federation of Canadian Artists, Whistler Art Council, and past Vice Chair of the Pemberton Arts Council. She donates to and participates in various charities and events. Her work is sold internationally and she takes private commissions upon approval.